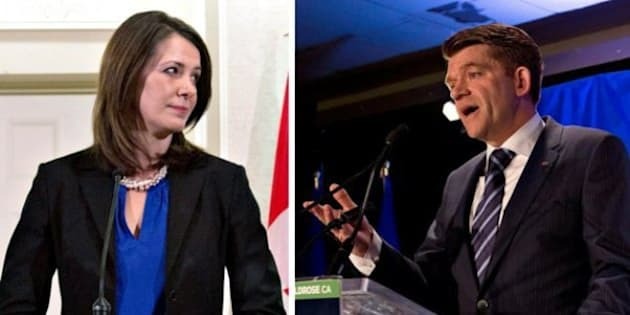 EDMONTON — Alberta Wildrose Leader Brian Jean says there is still no forgiving or forgetting when it comes to Danielle Smith, the former leader who gutted the caucus a year ago by leading a mass floor-crossing. "It's just not time right now. There was a tremendous breach of loyalty and trust that happened last year,'' Jean told reporters at the legislature Thursday. Smith is now a radio talk show host on CHQR in Calgary. Earlier Thursday, the CHQR morning show host asked Jean why he and his caucus members refuse to appear as guests on Smith's afternoon show. "There was a tremendous breach of loyalty and trust." Jean was asked later in the legislature news conference if it was a personal issue for him. "It is personal,'' he replied. "It's not disrespecting me to not come on this show. It's disrespecting you,'' she told her listeners. Smith made national headlines a year ago when she led eight of her Official Opposition Wildrose caucus members over to then-premier Jim Prentice and his Progressive Conservative government. Smith billed it as a reuniting of kindred conservative spirits necessary to keep the NDP from power, but voters didn't see it that way. Smith and the other floor-crossers were branded self-serving power seekers. None none of them were returned to the house in the May 5 election that saw Rachel Notley and the NDP win power. The Wildrose was left with five members after the defections but rallied under Jean to win 21 seats in the election to retain Official Opposition status. It won a recent byelection in Calgary to up that to 22. The Smith comments came up after Jean said it may be time to forgive and forget with the PCs and build a conservative coalition to defeat Notley. "We will continue to work with (the PCs) wherever we can to find issues of common interest,'' said Jean. He said Wildrose rank-and file have told him to keep the avenues of discussion open to merge like-minded conservatives. "I have my dancing shoes on ... and we are prepared and willing to look for a partner for a dance, and that would be in this particular case the PCs,'' he said. Smith said Jean's overtures mirror her thinking a year ago. And she said it suggests the hoped-for dissolution of support for Progressive Conservatives is not happening and that the Wildrose must now act to unite the right.